I usually am emphatic that the best way to improve model quality is to GET BETTER DATA!. However, Yesterday I used advanced statistics (well advanced for the business world I am in) to address a data quality issue. The situation arises due to restrictions put by government on the use of prescription data put in the public domain. When the data reaches my computer it has been through several hands and on the was some intentional noise is introduced and the relevant information put into bands to protect the individual GP. The way the annonimization is introduced may not be treated as fully random and independent noise. Usually I just define a binary target variable identifying the top 20% prescribers and fit a logistic regression explaining who are the big prescribers (or even better, who are the fastest growers). However, for a drug that has just been launched the rate of misscalsification in the data is too uncomfortable. About 30% of the prescribers are masked in the data handed to me as non-prescribers – Gahhhh! The less equal these probabilities are the more you should be worried even if both are relatively small. 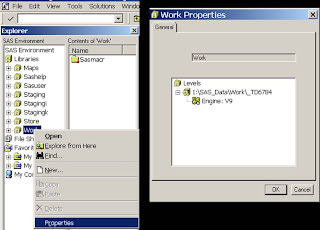 Experienced sas users usually know where to find the work folder and how to clean it manually. Now there is an elegant solution for Windows – at long last. Usually when the sas session is terminated, the application does some house cleaning. When the session is abandoned abruptly the work folder and its contents are left on the disk. In time these temporary files may clog up the file storage and slowdown the box. A Unix cleanup scrip has been around for a good decade or so but when it came to The Windows operating systems I used to occasionally purge the files manually. However, now there is a utility that not only cleans the work folders but also a little bit more. Note: Another container for unexpected file clutter is the sasuser folder. Mine is C:\Documents and Settings\eli\My Documents\My SAS Files\sasuser. A sloppy programmer will find there their output from SGplot and HTML reports accumulating rapidly. How do I know the physical path to the work folder? The standard installation will store all the work subfolders under C:\DOCUME~1\<windoes user id>\LOCALS~1\Temp\SAS Temporary Files. I have a desktop shortcut pointing there and occasionally I manually delete the subfolders there. and the result will show in the log window. How do run and schedule the cleanup utility? I did not have the utility installed so I found where to download it mentioned in this sas note: http://support.sas.com/kb/8/786.html.